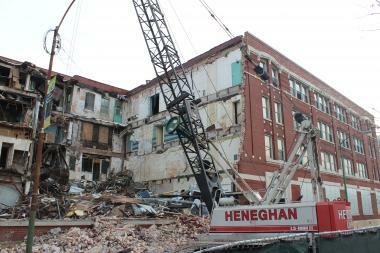 Demolition has started at the old Wrigley gum factory at 35th Street and Ashland Avenue. MCKINLEY PARK — Demolition has started on the old Wrigley gum factory, and down with it goes a part of the city’s manufacturing history. Wrecking crews this week have begun clawing away the structure at the southeast corner of 35th Street and Ashland Avenue, once home to the Wm. Wrigley Jr. Co. Built in 1911, the company's factory contained 175,000 square feet used exclusively for making the company’s signature gum flavors, like Spearmint and Doublemint. Other buildings on the 32-acre grounds included manufacturers of bags and burlap, doors, metal, kitchen cabinets, wholesale grocers and a lamp company. 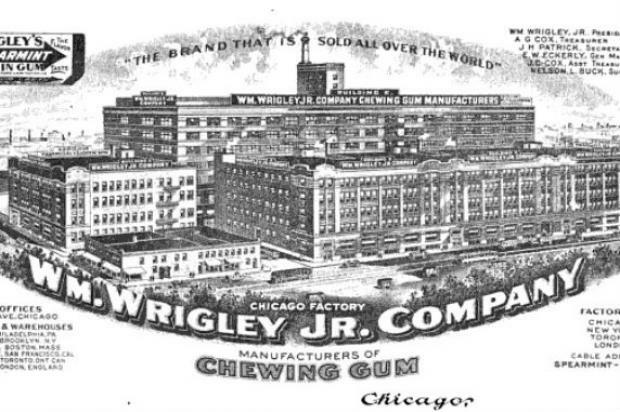 The gum plant was closed in 2006 after an about-face by the Wrigley company, which verbally agreed to keep the plant open “in exchange for a subsidy to build a research center on Goose Island” but never committed to the plan in writing, according to the Sun-Times. According to various media reports, a plan by the global real estate firm CBRE to turn the site into a high-tech manufacturing hub was scrapped, and CBRE sold it to Avgeris for about $5 million, a fraction of the $19 million asking price. Lombard-based developer Avgeris and Associates closed on the property in April 2012, hoping to open a huge retail development that could either include a big-box retail store, a strip mall or some combination of both. Developer J.C. Avgeris said the building's demolition was “safety related” and the plans to convert the land are hung up with the city’s zoning committee. City records show the area remains zoned for a planned manufacturing district; the developers want it changed to retail. “We’re just waiting,” he said. The ongoing demolition is the latest development for a stretch of Ashland Avenue undergoing a dramatic overhaul. In January, a nearby warehouse on the same side of the busy road was destroyed in a historic fire that leveled the vacant, four-story building owned by a developer jailed on charges that he attempted to bribe a West Side alderman with Sox tickets and home repairs. That building and others were part of the city’s Central Manufacturing District, an industrial corridor named for its strategic location 14 miles from the city’s northern tip, 14 miles from the southern end and halfway between the western border and Lake Michigan. Adding to the evolving landscape is the ongoing demolition of the the bumpy Ashland “flyover” ramp, originally designed for cars to skirt the trucks heading to and from those industrial factories. And plans remain on the table for the Bus Rapid Transit project, a $160 million plan that would eventually turn Ashland Avenue into a 16-mile, center-lane, express bus route from from 95th Street to Irving Park Road by 2016.